As Summer 2012 operational assignments get underway, Will Singletary, AUP The Citadel class of 2013, shares his personal experience serving as a Coast Guard Reservist, heading to Boatswains Mate "A" School at Yorktown, VA.
At the start of my college career as a cadet at The Citadel, joining the Coast Guard was never a thought in my mind. At the end of my knob (freshman) year, I heard about the Auxiliary University Program (AUP) on campus - the "Citadel Detachment". The Citadel Detachment consists primarily of a group of cadets whose ultimate goal is to serve as either active duty or reserve in the U.S. Coast Guard. I joined at the end of my knob year and began to learn about the Coast Guard’s roles and missions. Pictured Left: Mr. Singletary (back row, second from right) serves as cadet leader at AUP Unit at the Citadel during the 2012-2013 academic year. One of the first AUP units ever established, it has grown into one of the nation's most successful. After going through boot camp at TRACEN Cape May, I became even more knowledgeable about the subjects that I would be teaching to my fellow Citadel Detachment Cadets. I was in a unique situation that most Coast Guardsmen right out of boot camp are not faced with. I was a Seaman in the Reserves responsible for teaching cadets in college about the Coast Guard. During my junior year I served as the unit's executive officer and operations officer. As a part of these leadership roles, I had to coordinate training with the active duty Coast Guard, Coast Guard Auxiliary, and The Citadel’s schedule in order to make sure that the cadets were properly trained. On top of all of this, I was doing my drills as required each month with the reserves and coming in at least one afternoon per week in order to further my knowledge and get more training. Pictured Right: Mr. Singletary (left) and Citadel shipmate Alexandra Lariviere sailed with other Citadel cadets aboard the Coast Guard Cutter Dallas on her final voyage into Charleston, SC before decommissioning as a Coast Guard Cutter in February 2012. I am currently at BM “A” school in Yorktown, VA. It is important for me to learn everything I can to excel in my rate, and at the same time be able to bring back what I learn to the Citadel Detachment so I can assist and teach cadets on their journey in becoming Coast Guardsmen. What are the benefits of the Auxiliary University Program while serving as a reservist? 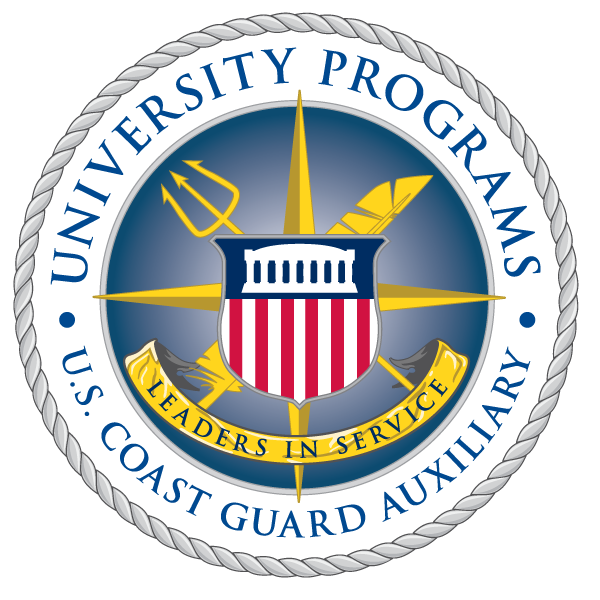 The Auxiliary University Program allows a member of the reserves to hone their Coast Guard knowledge and skills. The training program that is in effect allows a reservist to gain more experience and knowledge on all the different aspects of Team Coast Guard. After joining, expect to see how much Auxiliarists truly contribute to the Coast Guard. In most cases, reservists fill a billet at the same location for their entire Coast Guard Career. Joining the Auxiliary University Program allows for a reservist to get training with different commands, observe what other rates do, and experience different Coast Guard Missions. In addition, the AUP allows for a reservist to participate in leadership development studies and practical application of leadership skills. What are the benefits Reserve service while completing Auxiliary University Programs? First and foremost, you are committing to service for the United States of America. The sense of pride you will gain after saying the oath and completing boot camp is phenomenal. The reserve allows an Auxiliary University Programs student to gain even more hands on experience and added responsibility. A reservist/AUP student will be able to bring back to their AUP Program experience, and enthusiasm for the Coast Guard. Mr. Singletary serves at U.S. Coast Guard Station Charleston while completing his undergraduate studies at The Citadel. He will return to "The Military College of South Carolina" for one more year, 2012-2013, to serve as cadet leader and as a mentor to his fellow AUP students.